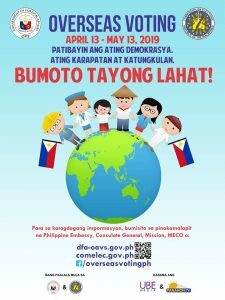 Check the Certified List of Overseas Voters (CLOV) to find out if you are eligible to participate as an Overseas Voter for the 2019 Elections. Kindly note that this list only includes Overseas Voters in Germany. You should have registered as an Overseas Voter and indicated Germany (Berlin) as the Post where you will vote. If previously registered, you should have voted at least one of the past two elections. Please stay tuned to announcements on our website and Facebook page for more information about the upcoming Elections, such as how you will receive your ballot. For inquiries, kindly send us an e-mail at info@philippine-embassy.de with the Subject: Overseas Voting. Thank you. *Click here if your name appears on the CLOV and you have changed addresses within Germany since you registered.